We’re back for another round of beauty box battles and once again familiar foes Birchbox and Glossybox are in the ring. Let’s see how they stack up. Ok, firstly I love a literary pun, Paradise Lost is a beast of a poem so points for that. 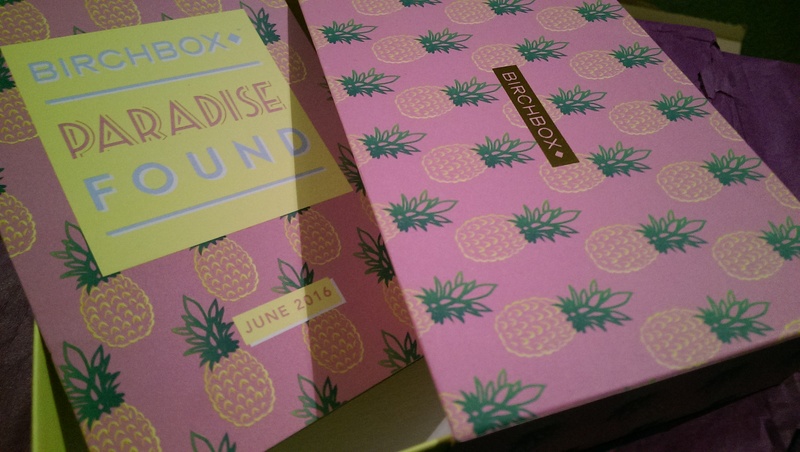 Secondly the drawer box is definitely scoring points, and it’s covered in the current ‘It’ fruit – pineapple. Inside the jaunty exterior lurk five beauty products. All sample size except one. Percy & Reed Reassuringly Firm Session Hold Hairspray – handbag sized for fixing your ‘do on the go, this has been nabbed by the Mr, who has run out of his manly spray for manly hair and been reduced to stealing my much girlier stuff. Monuspa Warming Ginger Bath & Body Oil – nope, it’s either for washing or moisturising, not both. Pure & Light Organic Skincare Essential Face Cream – the bottle isn’t particularly “ooh look at me!” but is filled with antioxidants and skin friendly natural ingredients – the rest of which is always does my sensitive excema and rosacea prone skin like it? BioNike Defence Tolerance – this is basically a tiny bottle (15ml) of micellar water. Something that only just manages to cleanse my face on a make up free day (I wash it after with more deep cleansing stuff), so not exactly wow. Stila Lip Glaze – I watched the BBC documentary about figure skaters ‘Making an Ice Princess’ recently and I am pretty sure the 11-year-old was wearing this gloss. I’m 29, so I’ll pass. Finally, this month for £8 you could upgrade your box with a pair of Quay Australia sunglasses. 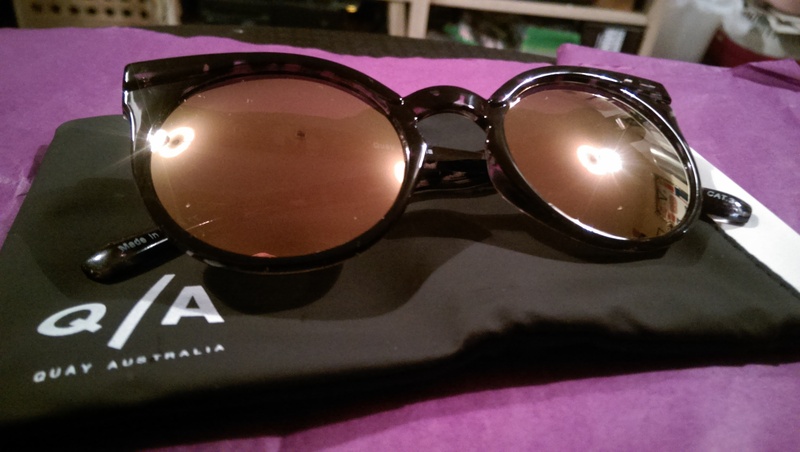 Now I rarely bother adding extras and nonprescription glasses are wasted on me but these would be perfect for a friend, so I got them to treat her (she doesn’t read the blog so I can tell you). The box is in GB’s standard pink and black livery this month with five items (plus a wee bonus) three full size and 3 sample. The product they’re most excited by this month is the Konjac Sponge – hailing from Japan and Korea (2016’s skincare top place) these sponges are made from the porous root vegetable konjac, gentler than a sponge, 100% natural and very squidgy, this is perfect for anyone like me who finds some cleansing tools too abrasive on their skin. Origins GinZing Refreshing Eye Cream – now GB are notorious for midgy samples like this 5ml tube, so tiny I couldn’t find it in the box straightaway. Considering the full size is £20 and Origins are supposedly focusing on expanding their UK market, a bigger sample would have been nice. This might just do my eyes twice before expiring, not that I’m reassured that ginseng and my sensitive eye skin will get along. 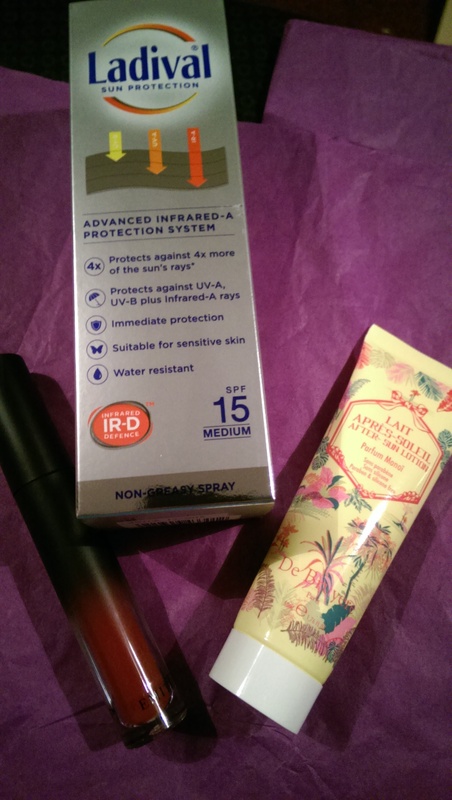 Ladival Sun Protection Spray SPF15 – designed for sensitive skin but not nearly strong enough (SPF30 or higher or stay indoors) but protecting against UVA, UVB and infrared A-rays, a non-greasy spray on would prevent the aforementioned burnt neck situation. Emitè Make Up Cheek & Lip Tint – theoretically I love two-in-one products, realistically it’s Benetint all over again. Great colour on lips, looks like I tried to do clown make up and mistook my cheeks for my nose. This is quite a deep red, and even with a bit o’ blending way too dark for my skin, but perfect for vampy lips. 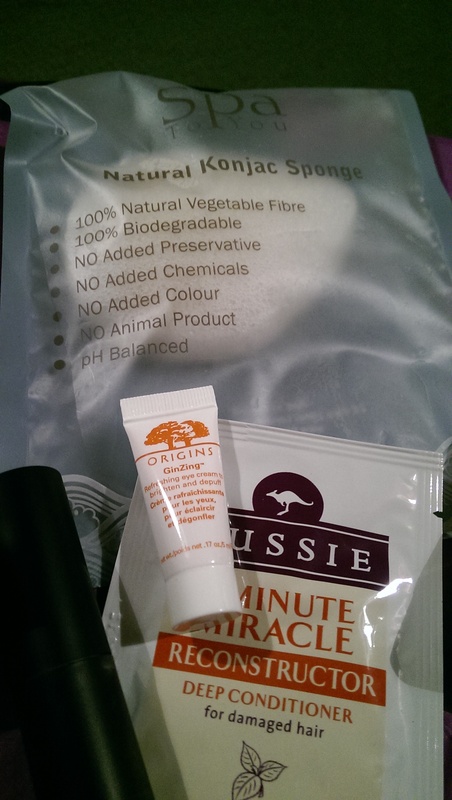 The bonus item is a sachet of Aussie Hair Care’s famous 3 Minute Miracle Reconstructor Deep Conditioner. So at the final bell, what do we think this month’s winner is? It’s a mixed bag really. 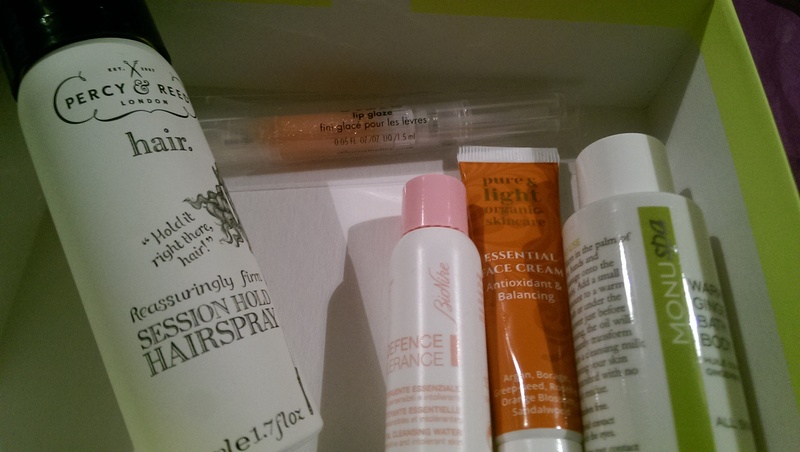 Can I have the Birchbox box with the Glossybox products? After a few truly dismal months GB have really pulled it out of the bag product wise while BB have backslid, although both could stand with having more generous sample sizes, you need a good few goes before drawing a conclusion on a product altogether. What do you think? 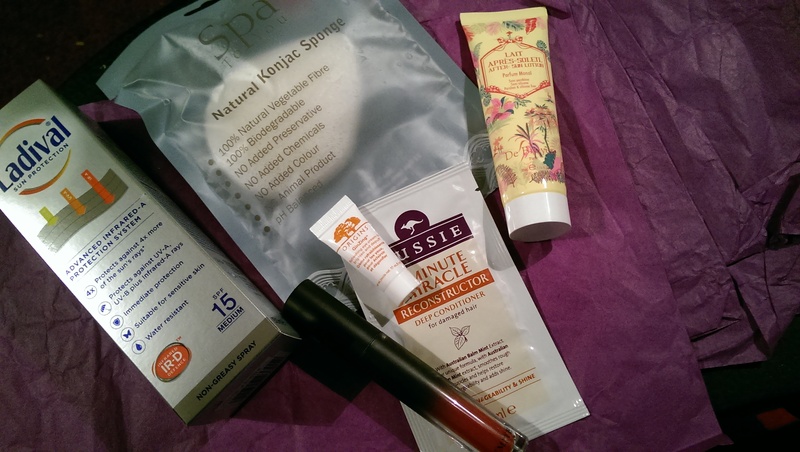 Were you wowed by this month’s boxes, or left feeling a little cheated? Let me know in the comments.